Secretary of the National Committee of the Association of Syrian Communists Qadri Jamil at a press conference on the situation in Syria, Moscow, Oct. 11. Former Syrian Deputy Prime Minister Qadri Jamil, a leader of the moderate Syrian opposition, believes that both the opposition and supporters of President Bashar al-Assad must unite against the Islamic State (ISIS) radical jihadist group before carrying out constitutional reform. 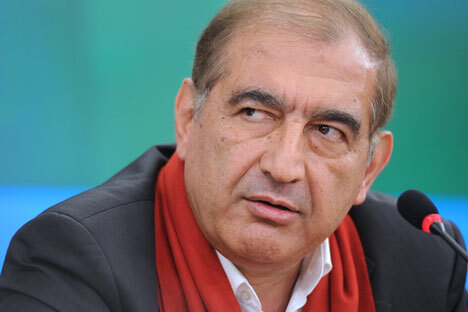 Since the beginning of the civil war in Syria, Qadri Jamil, until recently deputy prime minister, stood for a political settlement of the conflict and the establishment of transitional government with the participation of representatives of the opposition and supporters of President Bashar al-Assad. Jamil has a good knowledge of both Syria's ruling Baath party and Russian politicians and public figures. He graduated from the Lomonosov Moscow State University, speaks Russian and adheres to left-wing political views. He currently heads the Popular Front for Change and Liberation and is still in favor of dialogue between the government and the opposition. With whom in the Syrian opposition can you conduct a dialogue, since so many organizations and forces have armed formations? How do you know who is a terrorist and who is not? Qadri Jamil: Those who in principle agree to a peaceful settlement and ceasefire can be seen as moderate opposition. This is the main criterion. It is necessary to take into account the fact that at a certain stage of the war, the Syrians had one choice: to fight or to fight [he grins sadly]. There was no political solution; people were looking for an opportunity to join the power that could help them to save themselves and their families. Some went to ISIS, but we must understand that on the inside they are against Islamic State. And now we must either destroy those who are in ISIS en masse (which is almost impossible), or look for ways to split Islamic State. Let this be the same Free Syrian Army about which [Russian Foreign Minister Sergei] Lavrov said that it should participate in the political process. This is an escape route from the ideology of ISIS for many Syrians. And if the Free Syrian Army [the largest group in Syria fighting against the Assad government – Gazeta.ru] joins the coalition against Islamic State, we will find a common language with it. The Syrian problem is now complex and it should be solved comprehensively. But one of the Free Syrian Army fighters, Khalid Al Hamad, ate the heart of a captured Syrian regime soldier in front of a television camera. Do we need to conduct a political dialogue with him, too? QJ: Those who eat the hearts of soldiers, of course, cannot be part of the dialogue and there's nothing to talk about with them. As I said, you can hold negotiations only with those who agree to them. But there are also those who went to fight against the government due to objective circumstances. It is necessary to group together all the healthy forces of both the regime and the opposition against the worst enemy of humanity – ISIS. You support the Russian Federation's operation in Syria. But what about your political opponents, for instance, the president of the National Coalition for Syrian Revolution and Opposition Forces, Khaled Khoja, who called Russia's actions in the Syrian Republic ‘an occupation’? QJ: It's now a transitional period, which means temporary. When I was in the government, I endured Khoja for a year and a half. And then we will go to the polls and see who wins. I've always said if we do not stop the negative processes in Syria, we will soon have nothing to argue about, because there will be no Syria. There will be no country of ours. Now there are two problems; these are a huge humanitarian catastrophe and ISIS. It is immoral to speculate who will be the president and who will be the prime minister when half of the people of Syria have become refugees. But as for the Russian operation – yes, I support it. They do not talk about it for some reason, but the Russian air force intervened when Islamic State was already near Damascus, and there was a danger that the city would fall. Why, in your opinion, did the war start in Syria in the first place? QJ: We have some members of the government who like conspiracy theories and argue that it began in March 2011. I am not against the conspiracy theory, but then let's tell the full truth: Its first stage began in 2005, when Syria started liberalizing the economy, which resulted in the impoverishment of the people, a rise in unemployment. They have become the social base of the Islamic Revolution. The Islamists simply turned them in a certain direction, as well as providing weapons and money. A continuation of these processes followed in 2008, when the Syrian regime started trying to flirt with Turkey and Qatar. Under pressure from these countries, we started to change our laws and political system, their channels such as Al-Jazeera began to broadcast [in Syria]. They prepared the ideological ground for conflict. Today, ISIS in Syria and Iraq can be compared to Nazism in Germany in the 1930s. Populist slogans of leaders lead to the mass support among the poor people deprived of life prospects. You know very well the members of the ruling party in Syria – the Baath. Do you think its members have a political future in your country? QJ: Yes, the vast majority of Baathists are not interested in the continuation of bloodshed and are not associated with corruption. On the contrary, the war has affected them very negatively. They can well participate in building a new Syrian future with honest representatives of the opposition. And what will be the political future of Assad? QJ: His future will be determined by two factors: firstly, Assad himself, and, secondly, the Syrian people. It is necessary to hold an election after the political settlement. There will be nothing without it. What do you think about the experience of the Syrian Kurds, who have built their own system of governance in the north of Syria? Maybe federalization is needed? QJ: What is happening in the north of Syria, in Al-Hasakah, where self-government has been introduced, is a very interesting experience, which should be carefully studied and which could be used in the future, during the constitutional reform. Syria breakthrough: An end to the slaughter in sight? By the way, not only have the Kurds established a system of self-government there, there are also the Assyrians and Arabs; they have found a common language and have developed a governing method for the territory where they live. This method works successfully. And it happened because Damascus had no control over this part of the country under the circumstances. Just do not call it federalization. It happened in neighboring Iraq, and it clearly was not for its benefit. What exists in the north of Syria, I would call democratic self-government. We can and must speak about it, when we draw up a new constitution based on the Vienna Agreement. Many call the conflict in Syria a religious war. Do you think this is true? QJ: Religious contradictions – this is only an outline. In fact, there are both thugs and corrupt officials in all rival camps and in all confessions. The essence of the processes taking place in Syria is social.